Increase your wealth and power in more than 35 scenarios (like Spring Breakdown and El Presidente For Life) packed full of yuppie tourists, tropical storms, rebel uprisings, and more! Create a Tropical Paradise! Build swinging nightclubs, pristine nature preserves, lucrative rum distilleries, and over 90 other buildings! Create Your Dictator! If youve ever wanted to rule an entire island as a lying, paranoid, compulsive gambler, here is your chance! Take care of your people, or they will take care of you! Tend to your people as they deal with devastating disasters including hurricanes, popular rebellions, military coups, and U.S.-sponsored invasions. Feel their pain compassion makes great propaganda. Great Game of Political Strategy in the Caribbean! This is a quite intelligent and entertaining game, consistent with notions of political economy in tropical nations with a focus on tourism and political intrigue! As a politician with dictatorial inclinations ("El Presidente"), your goal is to remain in power for over 40 years, while developing the social, economic, political and environmental dimensions of an underdeveloped tropical nation-island. The personality traits of El Presidente will affect the development of the game. You get points by developing the island and also by stashing away money in your Swiss bank account. Social indicators define the level of "happiness" of your population. You have to develop housing, hospitals and colleges. You also have to develop entertainment and religion facilites, but your population factions will argue over your decisions, and your budget is limited. You have to oversee food production as the population grows, choosing export crops or subsistence food. You manage the economy of the island, by developing its infrastructure, factories and managing wage levels and labor conditions - in agriculture, manufacture, services, and state bureacracy. These decisions will affect the happiness and migration flows (to be influenced by your own INS agency!). It is fun to see how your country develops comparatively to other Caribbean countries. The most challenging industry is tourism. You manage hotels, restaurants, bars, archaeological parks, pubs, etc. In addition to foreign tourists, citizens also want to enjoy these facilities, so you need to define prices and entry policies. Depending on natural beauties, infrastructure, and criminality, tourism will stand somewhere between cheap and upscale. At the political level, you have to consider internal and foreign policies. By keeping your people happy, you remain popular and win elections. Otherwise, you may want to become a dictator - or lose the game. Unloyal generals may try a coup against you! In the meanwhile, you may want to bribe leaders of social groups: capitalists, socialists, religious, intellectuals, and environmentalists. Your strategic decisions are being watched over by the US and Russia (this is a 1950s scenario). Thus, you need a well-staffed Foreign Affairs Department, to strike good deals for your island and improve its economy and tourism! Some minor negative aspects: 1) the total population is too small (a few hundred only), and your army is limited to a handful of soldiers and generals. Some immigrants come from rich countries and work as poor peasants (unlikely...). 2) the map is out of scale: the area is way too small for buildings you create. 3) in installation: it did not install in my laptop and old desktop, and online support was not helpful. But Tropico has other attractive features. Your "gabinet advisor" is a funny guy with Latino accent and indirect jokes on your administration. The musical soundtrack is very good (with Salsa, Merengue, Bolero...). It is fun to see your citizens reacting emotionally to you, hailing you as a true leader or waving fists in rage fit. Fans of sim strategy games like SimCity and the Tycoon games will find much to love about Tropico. This game takes the whole SimCity concept and adds a political, Carribean twist. You play the role of "el presidente" of a small tropical island nation. Your goals include keeping your people happy, building a strong economy, and establishing good relations with the U.S. and Russia. You can build your economy around farming, mining, logging, fishing, industry, and tourism...you choose the resources that will be the most profitable for you. You also have to build churches, health care facilities, and provide adequate entertainment and housing to keep your citizens happy, and build schools and universities to keep them educated. If you don't keep your citizens happy they will likely to vote against you in the elections, but you can always choose not to have them. Be careful though, your citizens may rise up against you...better build up your military! There are also a number of edicts you can issue which can affect your success. There are a number of different scenarios you can play, but if you've played them all or just want to try something different, the "build your own game" mode lets you create your own. You choose the conditions on your island, level of difficulty, game length and victory conditions. Then comes the fun part: building your dictator! You can choose from a variety of personalities, rise-to-power methods, character traits, and flaws to build the type of ruler you choose to be. All of these will affect your gameplay and overall strategy. You can be a benevelent ruler who strives to make his people happy or a ruthless dictator who oppresses those who oppose him. The possibilities are endless! With all these choices, it's hard to play the same game twice. 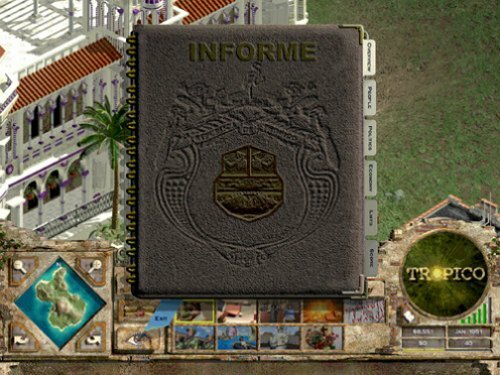 This replayability makes Tropico a game you're sure to enjoy for a long time. Great Game!!! Mucho-Macho FUn! Never get tired of it! The first day I got it, I was so excited. I read the manual before I played the game. If you were like me and tried to play before using the tutorial, you're in trouble. You'll feel frustrated. Read the manual and use the tutorial. Those are somethings that can help you. The basics of the game is to rule your own tropical island as a dictator and control everything. You have to make sure you get people to do the jobs, make everyone happy (especially the United States and Russia), and make sure your military is strong. About every 6 years, you will be able to choose if you want an election or not. If you do,your opponent will be announced and a chart will appear. It tells you how many people want you and how many people want your opponent. If you think you are losing, your government can alter the ballots, which is simply cheating. That may lead to rebellions, protests, uprisings, and especially Couped'at, where some of your military goes against you. If the side of your military still supporting you crushes the protest, you'll be safe. On my game right now, I've been dictator for over 40 years. I don't know how long you can be dictator, but it doesn't matter. Maybe it's the wonderful music and bright graphics as much as the gameplay per se, but I find it impossible not to enjoy myself while playing Tropico. I see many before me have already written rather extensive reviews, so I'll just say, "I agree."